Ever since prehistoric times the Indonesian archipelago has been inhabited. Java Man or pithecanthropus erects (upright ape-man) is the oldest known inhabitant here, having lived over a million years ago. Other more recent prehistoric species include the still disputed homo Floresiensis, or the Flores hobbits, dwarf people, who have also made these islands their home. this was followed by the construction of the elegant Hindu Prambanan Temple built by the Civaistic king Rakai Pikatan of the Sanjaya line. Historically, Chinese chronicles mention that trade between India, China and these islands was already thriving since the first century AD. The powerful maritime empire of Srivijaya with capital around Palembang in southern Sumatra, was the centre for Buddhism learning and was known for its wealth. The Borobudur Temple Compounds is one of the greatest Buddhist monuments in the world, and was built in the 8th and 9th centuries AD during the reign of the Syailendra Dynasty. The monument is located in the Kedu Valley, in the southern part of Central Java, at the centre of the island of Java, Indonesia. The main temple is a stupa built in three tiers around a hill which was a natural centre: a pyramidal base with five concentric square terraces, the trunk of a cone with three circular platforms and, at the top, a monumental stupa. The walls and balustrades are decorated with fine low reliefs, covering a total surface area of 2,520 m2. Around the circular platforms are 72 openwork stupas, each containing a statue of the Buddha. The vertical division of Borobudur Temple into base, body, and superstructure perfectly accords with the conception of the Universe in Buddhist cosmology. It is believed that the universe is divided into three superimposing spheres,kamadhatu, rupadhatu, and arupadhatu, representing respectively the sphere of desires where we are bound to our desires, the sphere of forms where we abandon our desires but are still bound to name and form, and the sphere of formlessness where there is no longer either name or form. 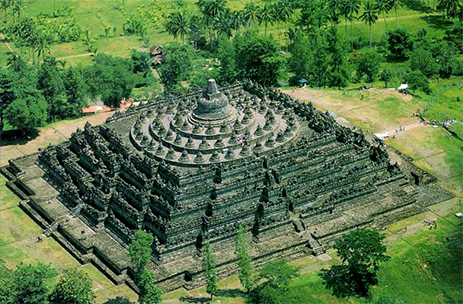 At Borobudur Temple, the kamadhatu is represented by the base, the rupadhatu by the five square terraces, and the arupadhatu by the three circular platforms as well as the big stupa. The whole structure shows a unique blending of the very central ideas of ancestor worship, related to the idea of a terraced mountain, combined with the Buddhist concept of attaining Nirvana. Lembongan Island Reef Cruise offers a full day’s activities – above and below the water. The luxury Bali Hai II catamaran moors alongside the purpose-built pontoon in peaceful Lembongan Bay. See the island’s exotic marine life and colourful corals from the comfort of the semi-submersible coral viewer. Try snorkeling for a closer look or enjoy a host of other activities: unlimited banana boat rides, a cultural tour of the island or exciting 35 metre waterslide. And when you’ve worked up an appetite, feast on a delicious buffet served in air-conditioned comfort. 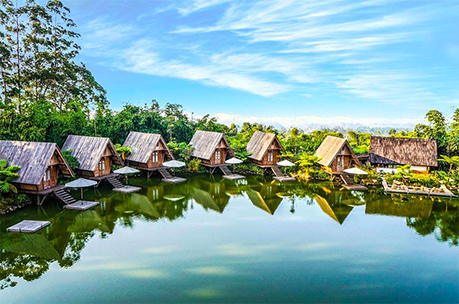 Bedugul is a mountain lake resort area in Bali, Indonesia, located in the centre-north region of the island near Lake Bratan on the road between Denpasar and Singaraja. Bedugul is located at 48 kilometers north of the city of Denpasar. Other nearby lakes are Lake Buyan, and Lake Tamblingan. Pura Ulun Danu Bratan, Bedugul, is one of the very famous attractions in Bali – Lake Bratan (Lake Danau Beratan), with the beautiful temple Ulun Danu Bratan, on its shores – its breathtaking scenery. The Bali tours to Pura Ulun Danu Bratan has given most visitors a rather serene feeling that calms their spirits. 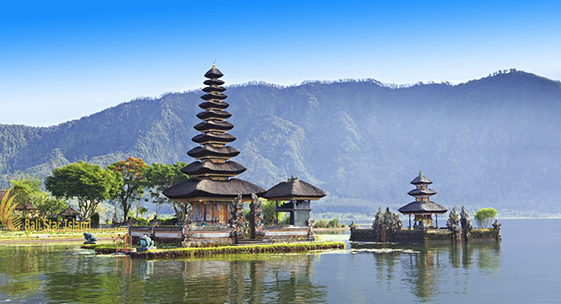 Ulun Danu Bratan temple is one of the most natural beauty highland shrines in Bali. Danau Bratan is most likely one of the most picturesque and most photographed temple in Bali.It is almost “a must” for all tourists on Bali, to make a tour to the Ulun Danu Bratan Templeand its surroundings – it is a very relaxing and beautiful place – one of the most famous attractions Bali. Bali has many wonderful river, such as Ayung River and Telaga Waja River are suitable for typical of water sport adventure. Each of them are in grad III, but if it come to rainy season the grade can be increasing to lever IV. Bali River Rafting is ready for you to enjoy all the rapid along the river. Mostly all necessary equipment needed for this activity are already prepare such as life jacket, paddle, helmet also a car for transfer from and back to your hotel. Bali River Rafting offer the package already include towel, lunch and the most important one is the life insurance cover. For those of you never doing any such white water rafting, there will nothing to worry about since before all the guest ready to start the adventure, there will be special rafting guide or instructor who will lead you on the river and control the boat until reaching the finish point and before that you will trained a little bit how to paddle, what to do will all of their instruction, so you can enjoy the white water rafting. Your rafting adventure will be start by using helmet and life jacket, after a short briefing regarding some special instruction of how to paddling, and some information how to save yourself on the running river. As warming up ans stretching to all muscle and every part of your body, you will be going to the foot steps down the hill to the river, while enjoying the scenery of the growing green healthy fruit tree, such as manggis, durian, rambutan, coconut, etc. 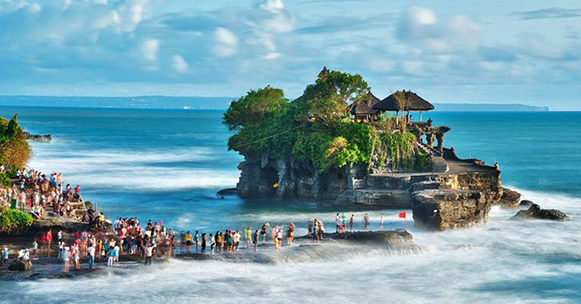 Tanah Lot Tour is an exciting tour programs to visit a beautiful temple set on the rock located in Tabanan regency, is part of Bali Island. The tours will bring you to the impressive experiences to visit Tanah lot including some place of interest along the tour. Our tour guide is professionally encouraging you with complete information about Bali and tour destination to visit, those are completing your lovely holiday experiences in the island of God. Your journeys will completely comfortable riding on full air conditioning vehicle driven by safe driver. Tanah Lot is the most favorite tourist destination in Bali that is many visited by tourist every day in particular at sunset time. This area is well featured by the beautiful Hindu temple on the rock and spectacular sunset with romantic ambiance that was fascinated everyone to visit. It is huge area that was well maintained with green lush tropical garden and complete public facilities. Please see more detail about Tanah Lot Temple. Bandung is the capital of West Java province in Indonesia, the country’s third largest city by population, and second largest metropolitan area in Indonesia with a population of 2.4 million in 2010. The Dutch colonials first established tea plantations around the mountains in the eighteenth century, and a road was constructed to connect the plantation area to the capital (180 kilometers (112 miles) to the northwest). Home to Indonesia’s many textile factories, the city of Bandung offers a large number of factory outlets where Jakarta shoppers regularly flock to, to find the latest trendy apparel at reasonable prices. Those planning to travel to cool climates will stock on warm clothing here in Bandung. You will find Factory outlets or distribution stores (known as Distros) dotting the main Dago avenue. Leather shoes, jackets, bags, and goods in Cibaduyut will delight young and old alike. Since Bandung has so many choices of food, why not buy the famous batagor, brownies, molen, and other delicacies for your loved ones. Kawah Putihis a striking crater lake and tourist spot in a volcanic crater about 50 km south of Bandung in West Java in Indonesia. Kawah Putih lake is one of the two craters which make up Mount Patuha, an andesitic stratovolcano. Mt Patuha is one of numerous volcanoes in Java. Kawah Putih Crater Lake itself represents a relatively stable volcanic system with no records of significant activity since around 1600. The Kawah Putih site was opened to visitors in 1987. The lake is 2,430 meters above sea level so the local climate is often quite chilly (temperatures are frequently around 10 degrees celsius). This makes a brisk change from the humidity of the north Java plain and the capital city of Jakarta. 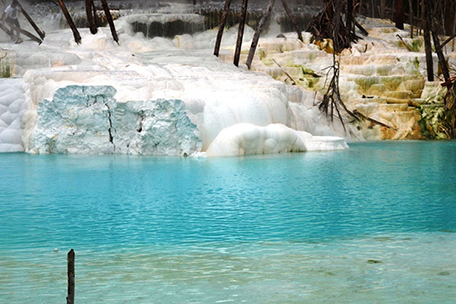 Kawah Putih is a sizeable highly acid lake which changes colour from bluish to whitish green, or brown, depending on the concentration of sulfur and the temperature or the oxidation state. The sand and rocks surrounding the lake have been also leached into whitish colours through interaction with the acidic lake waters (with possible mineral precipitation as well). Batam is an island, municipality, and the largest city in Riau Islands Province within Indonesia. Batam is a free trade zone, part of the Indonesia–Malaysia–Singapore Growth Triangle, located 20 km off Singapore’s south coast.Also it is a great place where you can enjoy fresh seafood, cheap shopping, water sports, interesting attractions and affordable massage parlors. And of course, you can choose a beach resort which is great if you stay overnight. 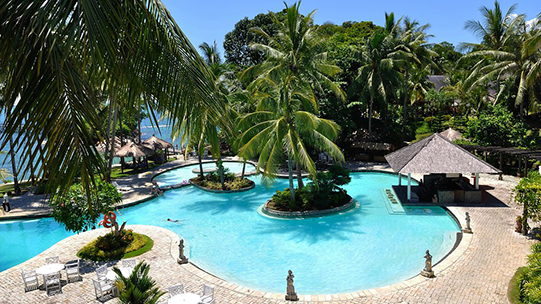 Island getaways are very connected to the beaches and Batam has a beach for every need. For those looking for some water sports activities can come to the beach Nongsa and Waterfront City.